Description: 12 inch spheres / pedestal base - 48 inch high - $2500 includes shipping and internal pump to any US location. 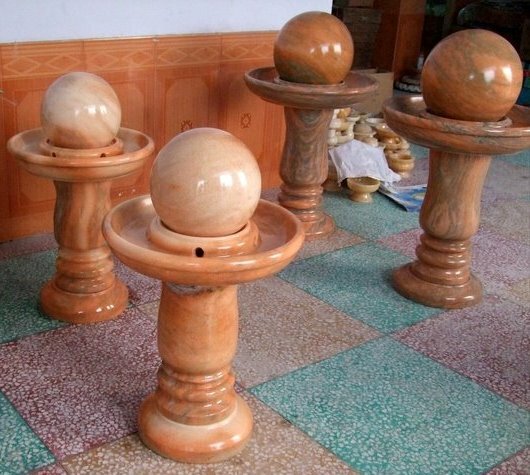 - The pedestal base which is a feature fountain design from Topstone comes with various water feature supplies, such as the marble balls come in natural marble or the stone ball that affords the main attraction. Supported on a solid base, this delicately carved piece showcases the kugel ball in all its round smoothness. This creation works well as indoor water features. When placed on a high plane, these raised wonders can also work equally great as garden sculptures. The sphere fountain is a sister product that makes use of the kugel ball to transform an open area. These can be found at a reasonable rate at any water fountains for sale outlet or online site.